Many Dallas citizens are unaware that our city is home to the largest urban hardwood forest in America—the Great Trinity River Forest. Lying in Southeast Dallas, between I-45 and U.S. 175, this massive forest encompasses over 7,000 acres that straddles the Trinity River. The forest is home to many species of trees, birds, and other wild life, and represents the largest contributor to Dallas’ urban forest. In recent decades the Forest has declined due to neglect, pollution, illegal dumping and invasive non-native plants such as Chinese Privet or Chinese Tallow that suppress native plants and trees. Fortunately though, the city, working with state and federal agencies is committed to conserving and restoring the Trinity Forest. In 2006 the city authorized the development of a long-term management plan for the forest that will span well into the latter part of this century. 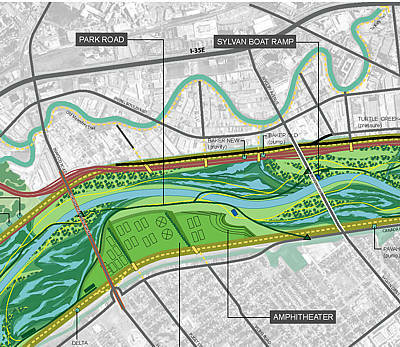 The plan was developed by Stephen F Austin University in cooperation with the committee and the Trinity River Corridor Office. This comprehensive management plan, which was completed in 2008, addresses many areas from tree conservation, protecting wild life habitats, flood control and public access for hiking trails and campsites. The committee chair recommended and lobbied for the development of a forest management plan long before the committee was established. In 2008, the city working with the Audubon Society took a historic step forward and opened up the Trinity River Audubon Center, which allows Dallas residents to explore this wonderful natural resource and is built on an old landfill. Dallas area residents, especially school children, can visit the center, learn about the wildlife and ecosystems, explore some of the nearby trails, and discover the forest’s wonderful tree species. The Urban Forest Advisory Committee supports the center and provided advice regarding tree planted on the site. The committee and its Citizen Foresters are working with Groundwork Dallas to develop nature trails that extend outward from the center.